Sprinkle beef with salt and pepper. Place beef in 3 1/2- to 4-quart slow cooker, sprinkling onion and mushrooms with liquid between layers of beef. Pour soup over beef. Cover and cook on low heat setting 7 to 8 hours or until beef is tender. Two cups sliced fresh mushrooms can be used instead of the mushrooms in the jar. No additional liquid is needed. 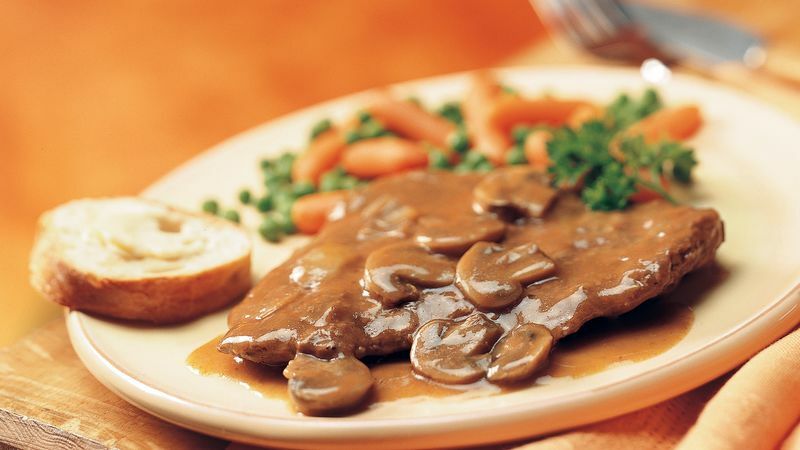 You can add 2 cups baby-cut carrots to this Swiss Steak. Place the carrots in the bottom of the slow cooker.